A MARRIAGE THAT BEGINS IN HELL HAS NO PLACE TO GO BUT UP! Thank you for choosing Hell, Michigan to lay your single lives to rest and join two souls in matrimony. 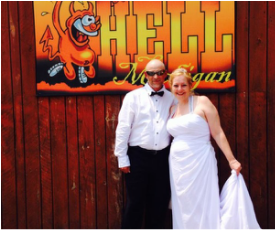 We are honored to host hundreds of weddings here in Hell, so rest assured, your wedding will be a memorable, happy occasion. 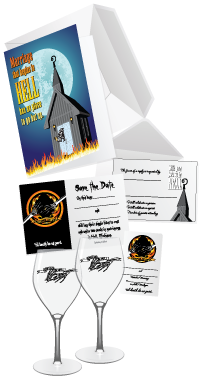 Hell's Chapel of Love is both quaint and fun, from the question mark on the top of the steeple, to the blue doors meant to ward off evil spirits. 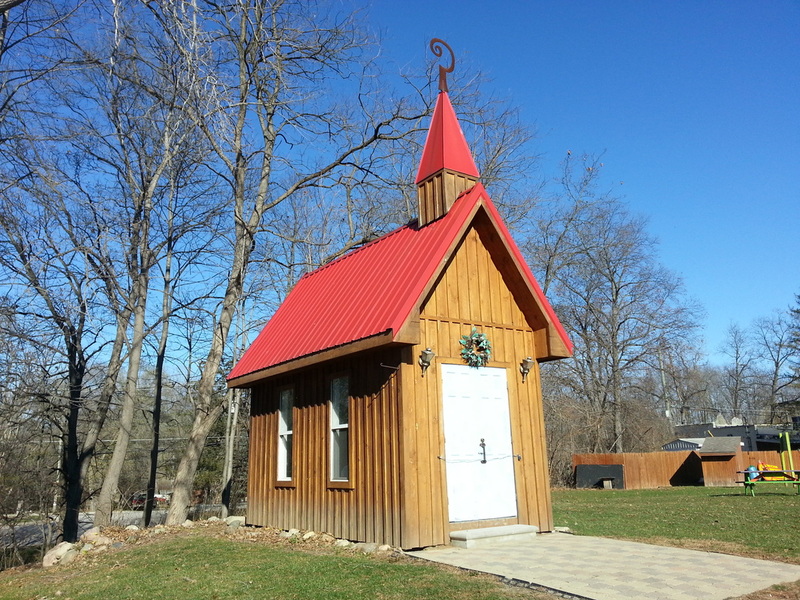 The chapel itself holds a dozen guests including the couple and officiant, but our park-like grounds can accommodate an outdoor ceremony of up to 150 guests. Hell's Chapel of Love and Hell's grounds can be rented by the hour. Cost: $100 for the first hour; $80 per additional hour. This also includes a reading of your wedding proclamation in Hell, Michigan, two complimentary wine glasses, and a special United in Hell magnet. This does not include the officiant, catering, bar services, rental equipment, etc. Those are additional and arranged separately by you. Please see below for more information on these services. We know you may have questions, after all this is Hell! Contact us via the wedding inquiry form below, or give us a call at Screams Souvenirs from Hell & Helloween at (734) 878-2233. 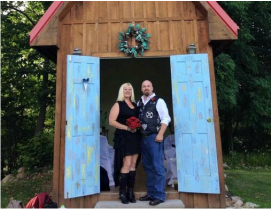 ​If you have your own officiant, you are welcome to use them. when you send the inquiry below, and we'll send you more information by email. based on your budget, preferences, and needs. Beer/wine must be purchased through, and served by, Hell Hole Bar; Special Orders are welcome. will be provided at your booking if needed. for purchase at Screams Souvenirs from Hell & Helloween. please contact us via the form below or call (734) 878-2233. For the first hour reservation: click here and add to cart. For additional hours: click here, change quantity as needed, then add to cart. Upon checking out, your date and time will be reserved for your special day. Hell's Chapel of Love is owned and operated by Screams Souvenirs from Hell & Helloween. If one is the contact person listed above, then you only need to fill in the name of the future spouse. Please double check that your Email Address is correct! We love email, but if you prefer a phone call, please leave us a note. Please indicate the date you are inquiring for availability. Please give the time your Ceremony will begin, and how many total hours you wish to reserve Hell's grounds. I plan to bring my own officiant. Please send me information about Hell's officiants. Any additional information or questions about your event?